Other indicators also generally corroborate the view that while the labor market has improved, it still has not fully recovered. For example, the rate at which employees quit their jobs for other opportunities has tended to go up in a strong economy, since more workers voluntarily leave their jobs when they have greater confidence about their ability to find new ones and when firms are competing more actively for new hires. 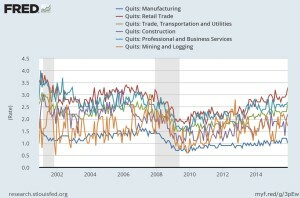 Indeed, the quits rate has picked up as the labor market has improved over the past few years, but it still is not as high as it was through much of the early 2000s. Another important indicator is the number of available positions, or job openings, that employers currently have posted. Job openings have increased significantly over the past year and a half, and, in another encouraging sign, the pace of hiring has also stepped up in the past year or so, though it too continues to run somewhat below the levels that prevailed through the middle part of the last decade. It is worth mentioning that JOLTS data is lagged by two months – thus investors will need to wait until early March to reassess labor market conditions in January, when market volatility and uncertainties in a number of industries may have discouraged voluntary separation and pare job openings.